Cupping originates from China and has been used for centuries to treat many different conditions. The technique uses suction to draw the tissue up and separate the muscle, skin and fascia layers. This technique also attracts the local blood flow and releases histamine which helps to break up adhesions and create a pathway to clean out toxins through the lymphatic system. Miofascial Cupping also called MFD (Myo-Fascial Decompression) has in recent years widely been used in athletic training to recover muscles from work outs, to relax muscles from spasms and through injury recovery to reduce scar tissue and adhesions and reduce trigger point pain and local inflammation. 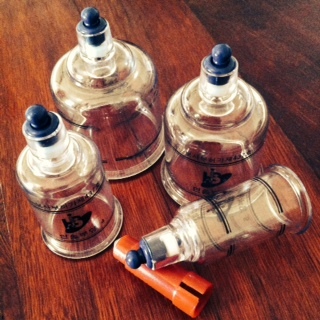 This more modern cupping uses different sliding techniques to work efficiently on muscles in addition to short stationary cupping which does normally not cause any bruising.